, I was not ready for its message. When I read it again, a few years later, it made complete sense to me. I now have a well-worn copy with some lines pencil marked (no, I never use a highlighter or a pen in a book – more about that in another post!). I decided to share these with you today. 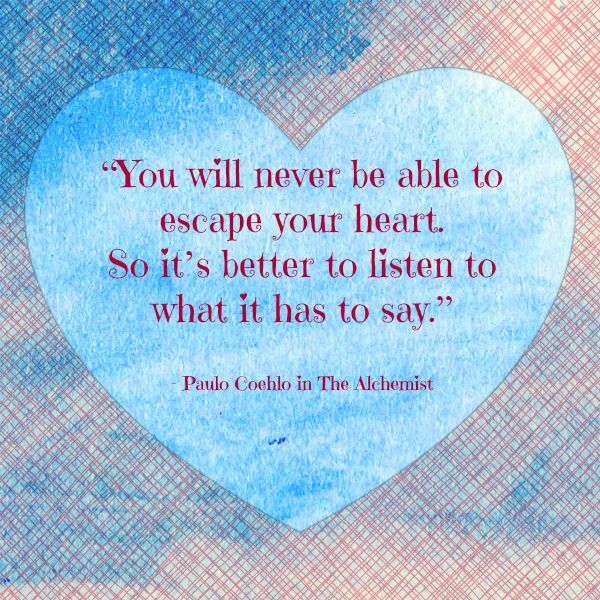 Have you read The Alchemist? Do you have a line from it you treasure? We’re on Day 8 of the September Blogging Challenge. I hope you’re enjoying it – making new connections and solidifying the old ones. This sounds like a wonderful book. I have somehow missed it but maybe now is the right time for me to read it! Thank you for sharing these inspirational quotes – they are beautiful. I haven’t read this one yet, but it’s on my list! Great post as usual Corinne. I haven’t read it yet, but will definitely put it on my “must read” list. It sounds about right for my life right now. Hi thanks for this post. I will have to read this book now. The quote I love the best is “when you can’t go back, you only have to worry about moving forward. It is very true for my life today. I had a family issue this week that rocked me a little bit. I am praying about how to deal with it and how to move forward. Sorry to hear about the situation, Mary. I pray for peace for you and your family. So happy to see you back, Kathy. Thanks for being a part of the September challenge. Great quotes you chose, Corinne! Very inspirational! Glad you found them inspiring, Terri! Exactly! I tried reading the book about seven years back and honestly, I didn’t understand a world. But about six months back and Voila! It opened a new world to me! I love every quote that you have put here. Esp. the graphic! Thanks for sharing them. I read the Alchemist when I was about 18 or so and didn’t really like it. I think I should try and read it again as I’m in a completely different stage in life and more open and trying to be less cynical. Yes, it might work for you this time around, Sanch. I haven’t read the book. I don’t tend to walk away from books with inspiring quotes – I more end up immersed in the book (or not) and walking away with certain feelings. “Never Let Me Go” by Kazuo Ishiguru was one such book. It stayed with me for months! Oh no, this is not a book of quotes, Alana. It’s an allegory. I picked up these lines from the book. Yes, Leanne. It’s pretty much the same message, isn’t it? Inspiring quotes, great graphic too! Did you make that? Putting this on my TBR. It’s an allegory that you might enjoy, LuAnn. Even i didnt realize that there are wonderful messages in this book when i first read.. i think, i have to read the book again now. Hope it makes more sense to you the second time around, Mahathi. That’s one of my favourite quotes too. I’ve never read The Alchemist eihter. These quotes are great though. Not quite sure what you meant, Tara. I was just reminiscing about how much I like Paulo Coelho. I guess that tone wasn’t obviois. I love him. My favorite work of his is his 20 year anniversary introduction to The Alchemist, followed closely by The Zahir and Witch of Portebelo. Oh, I can’t stand pen/highlighter marks on a book either. A pencil is my writing implement of choice – followed by a fountain pen for writing letters. Inspiring post, Corinne! Thank you! Oh yes, Vidya. I’ll keep my thoughts about that for a post. Thanks for sharing your favourite one! Remember that quote, ‘When the student is ready, the Master arrives’ or words to that effect….might apply in this case. Sometimes, a book just may not work for someone and that’s fine too, no?